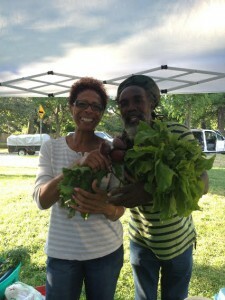 On Tuesday I sat down with Annette and Desmond who have been bringing bountiful organic veggies and greens each week. This dynamic team are always so positive at the market and have great jokes to go along with their produce! Annette: Desmond was the one that actually started farming and then I became sort of his assistant. I water, weed, wash the veggies and package them. Michelle: Great! So how long ago did you begin? Desmond: Around 7 years ago. Were based out of McVean farms in Brampton. Michelle: So you folks are very close to us then! What inspired you? Desmond: The love for farming. I started growing first and getting people to go to the market for me, and then people asked me – why not do it yourself? So it’s been a really wonderful thing, sharing what I love with the people. It feels good, at the market, sharing the love that I put into the food. Michelle: That’s really wonderful. It sounds like you have a great sense of pride in what you do. It’s very evident that you’re passionate about it. So you’re a completely organic farm, have you always been completely organic? Desmond: Oh yes, definitely. When I first started I wanted all natural, all natural vibes, only organic. That’s how we got our name – Organic Vibes. Michelle: Oh yeah – isn’t that creative! I love it. Alright, we would like to know what is your favourite Ontario produce right now and how do you like to prepare it. Annette: Mine is beets. I roast them in the oven, 30 minutes at 425 degrees. I put them in my salad or just eat them on their own. If I eat them raw I blend them with carrots and make carrot juice with nutmeg and vanilla. Delicious. Michelle: That does sound good. And what about you Desmond? Desmond: Callaloo. Just steam it lightly, maybe add some cod fish to that. Michelle: Anette was saying that coconut milk is really nice with it – almost like creamed spinach. Desmond: That’s number one for me. Michelle: Awesome! So great chatting with you two. Edmond at his market booth! Ed from Evelyn’s Crackers is a farmers’ market veteran, bringing healthy and flavourful baked goods to Cabbagetown. 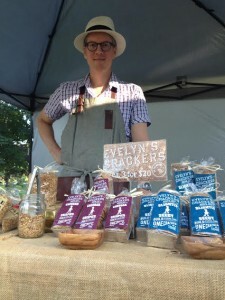 There is a great story about he and his wife Dawn started Evelyn’s Crackers. We’ve loved having them at the market each week. Michelle: Ed, we’d love to know how Evelyn’s Crackers started originally. Ed: My wife and I are chefs and bakers by trade. We moved here from the states and wanted to do something in farmers’ markets. We discovered red fife, which was an endangered grain at the time, so we wanted to incorporate that and figure out a way to use it at the farmers markets. My wife is a bread baker, but there’s a lot of bread at the farmers market, so we decided to do crackers instead to fill that niche. Michelle: Which farmers market did you begin with originally? Ed: It was Riverdale, here actually. Michelle: So you were one of the original vendors – That’s wonderful. Ed: We did Riverdale, Brickworks, and Trinity that first year. After we were doing it for a while we started to discover other local grains. Southern Ontario is kind of a breadbasket of Canada, there’s a lot here – rye, buckwheat, etc. So the last year or so the evolution of Evelyn’s crackers has been into the heritage grain baked goods. Essentially we’re now a heritage grain bakery which is known for crackers. Michelle: Now you have cookies, tarts, granola, and so much more. That’s great you’ve been able to expand. Ed: Our creativity is something we’re always using to move forward. We try to advocate and show people that white flower is something that doesn’t really need to be used because it doesn’t add anything. Whole grains add texture, flavour, nutrition, and all that. Michelle: And it tastes so much better. Ed: Exactly. We’re also doing some wholesale as well. We’re at The Big Carrot, Fiesta Farms, all of the spots are on the website: www.evelynscrackers.com/. Michelle: Good for you! Now Ed what would you say you enjoy most in your work? Ed: The farmers markets for sure. We were really able to build our brand through the markets, getting instant feedback, testing our production, and how people respond to our product. Michelle: That’s so true – you’re able to see first hand what works and what doesn’t in order to make changes and be successful. Ed: Yeah that’s always enjoyable. And the conversations I have, meeting new people and educating people on the health benefits of different grains and all that is really rewarding as well. Michelle: It’s really nice when people actively care about what they’re eating and enjoy learning about those kind of things. On that note Ed, we would like to know what your favourite Ontario produce is and how you like to eat it? Ed: I really like to eat what’s in season. I shelled a bunch of peas the other night, and they were delicious. Just steam the peas with dill and add some butter at the end. I had it the other night with some Georgian Bay trout. Michelle: I’m sure it was delicious, Well I’ve really enjoyed getting to know you a little better Ed! Thanks for the chat.